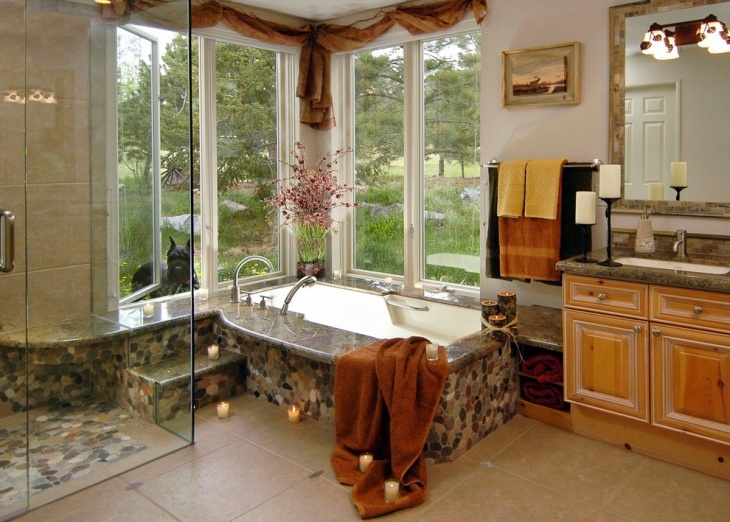 A river rock bathroom need not look dark, old or rustic. With the use of the right color scheme and application, a modern, sleek, luxurious, spa-like, traditional, and yes rustic look can be achieved. The trick is in choosing the right kind of natural rocks, matching them up with other materials (like tiles and wooden features) and placing them accordingly and effectively in place. 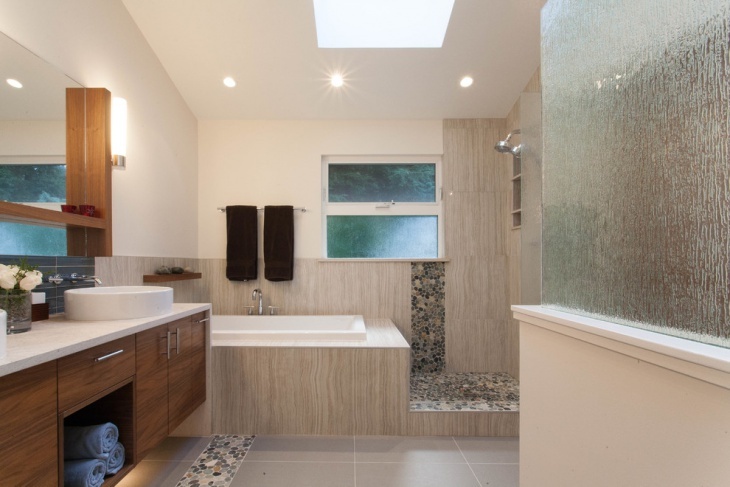 A modern bathroom can look neat by using natural river rocks in multiple shades of brown for the floor and a part of the wall of the shower area. 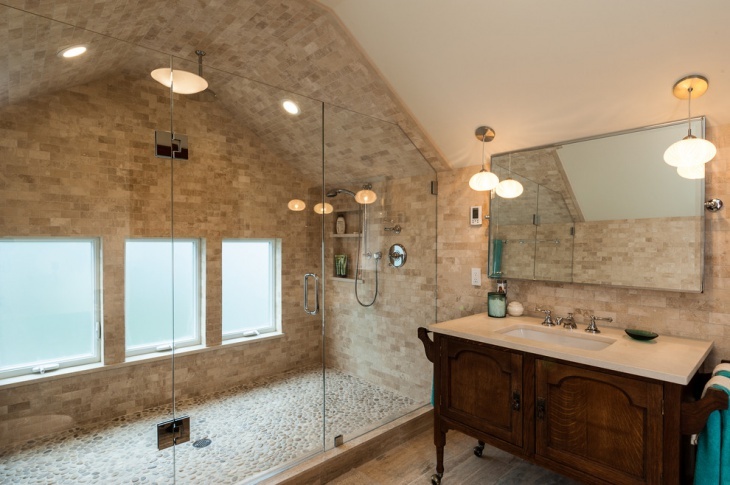 To complement the rustic nature appeal of the stones, the rest of the bathroom is designed in natural colors – earl gray color for the vanity mirror wall, hand stained and hand assembled hardwood cabinets, and wood porcelain tiles for the rest of the shower area wall. 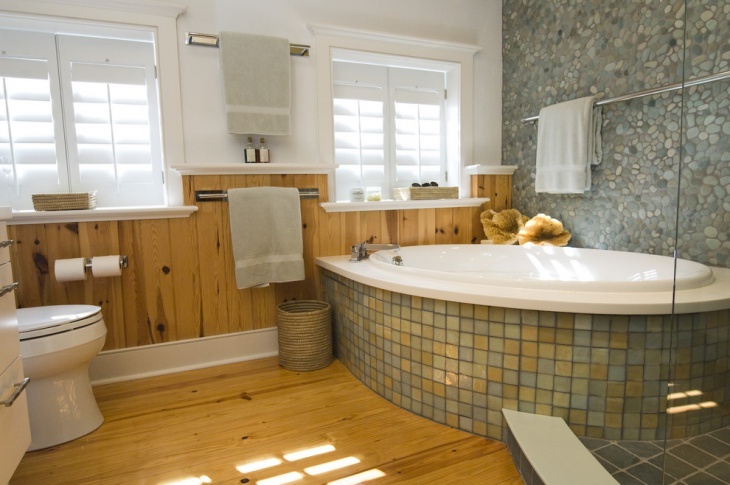 Creating a path of pebbles along the length of the sink area is a great idea for this stylish bathroom design. The single vanity mirror works well and its beauty is enhanced by the wooden side framings. 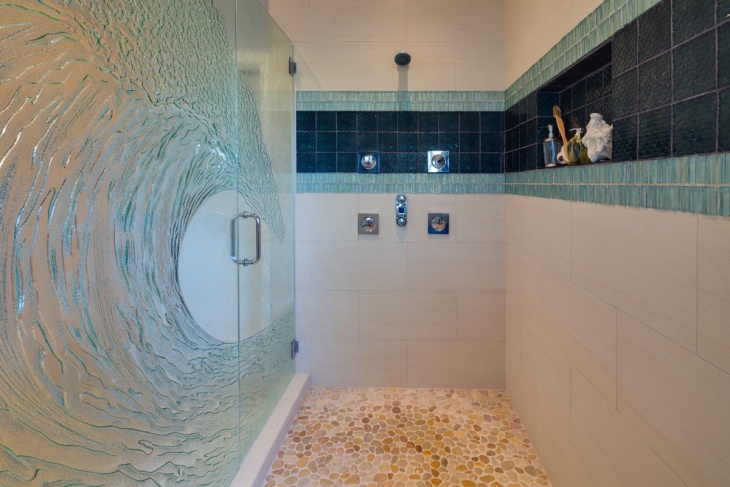 The same pebbles (Zebra Bay) are used for the shower area floor and a part of the wall. The privacy mirror facing the vanity mirror adds style and sophistication to the entire design. 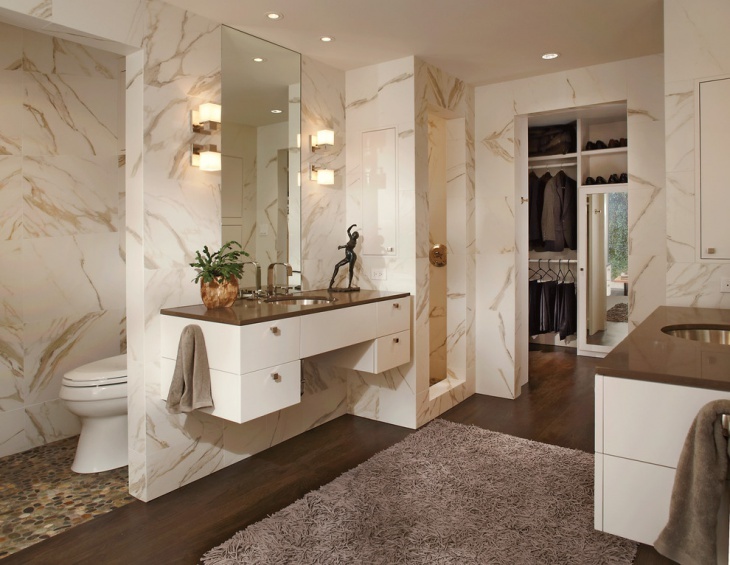 The whiteness of this bathroom truly stands out because of the dark colored river rocks used for some parts of the floor. The floating teak wood boards used for a walkway add color to the entire scheme. 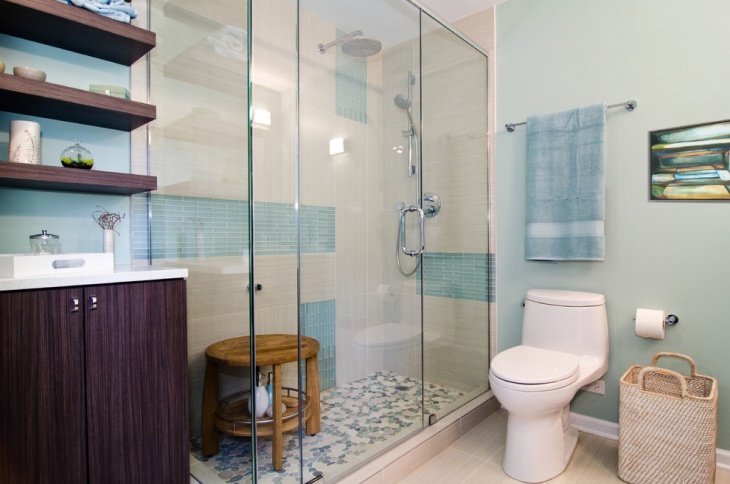 The shower enclosure also has wooden flooring, for an added cool look. 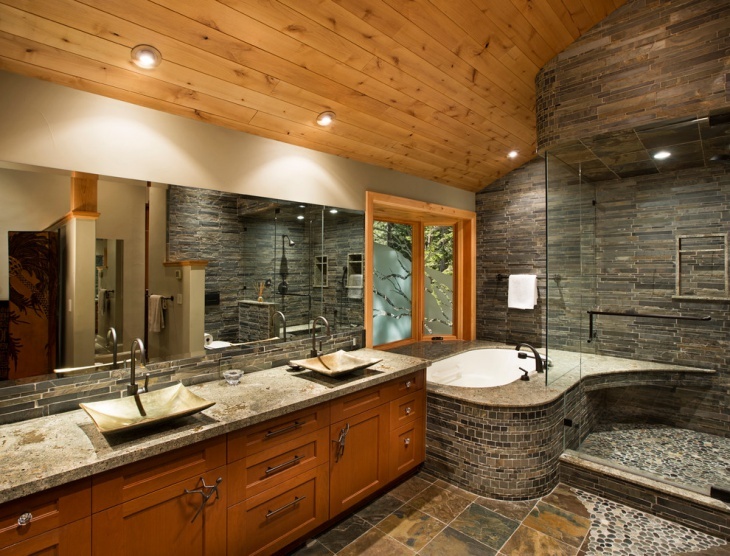 If you want a bathroom with a true rustic appeal, you may want to go for a wooden ceiling combined with river rock formation coming right out of the shower. 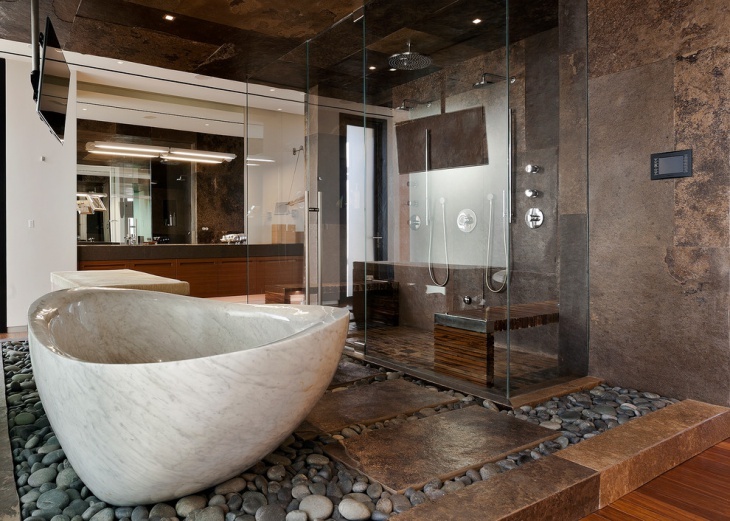 This lavish bathroom idea is a real masterpiece with the unique transition from tub to shower. 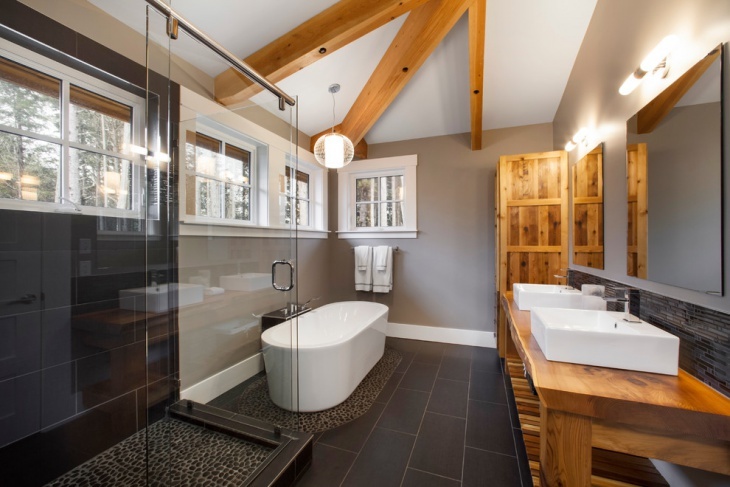 This trendy bathroom design provides a zen look with the solid maple, hand-carved freestanding tub sitting amid a sea of gray-hued river rocks. The floating rectangular copper tiles placed over the rock tiles create a contrasting look against the lightness of the tub. The shower area is of an enclosed glass design with a wooden (teak) bench inside. 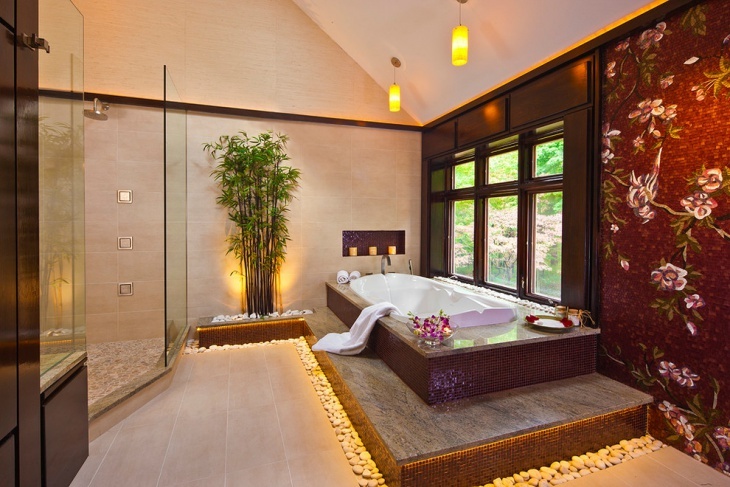 This bathroom takes tropical soaking to the next level. 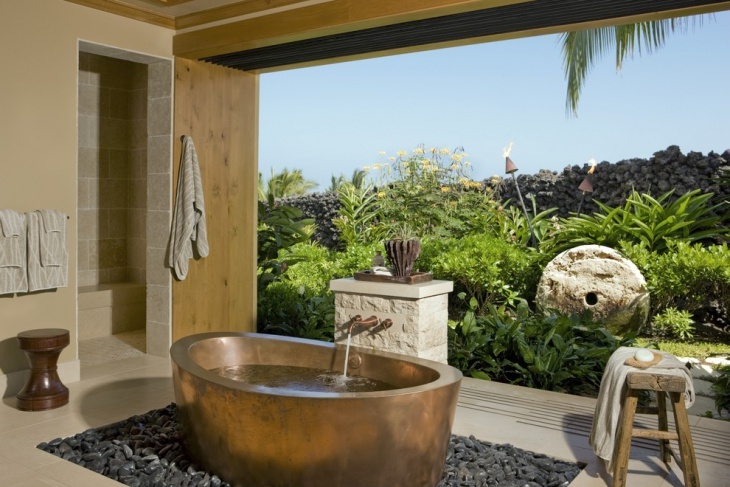 The bath opens directly to a lush green main garden guarded by a lava wall and the copper tub creating a main visual feature. The tub is set in the middle of dark colored and framed Hawaiian river rocks, making this a truly magical tropical bathroom idea. 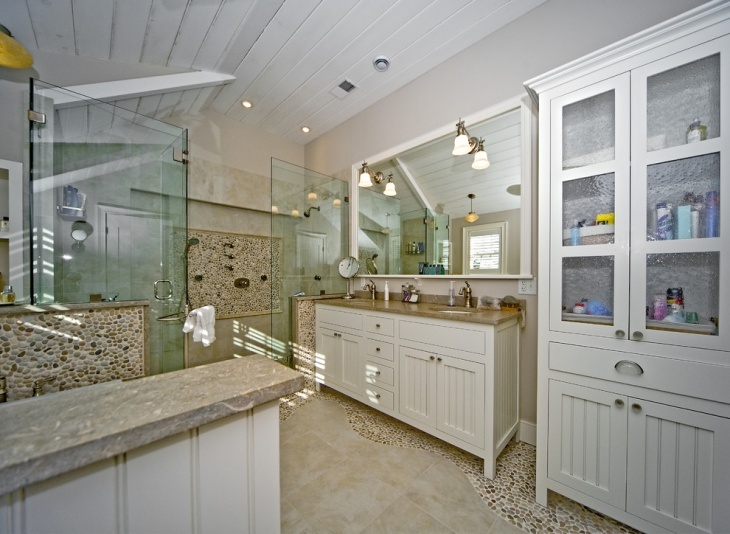 The antique cabinets give this bathroom the traditional or vintage look. 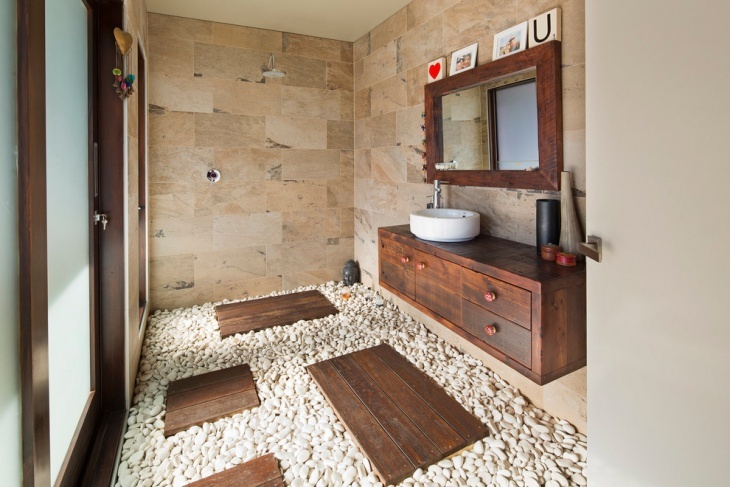 The river rock on the shower floor provides the rustic appeal. 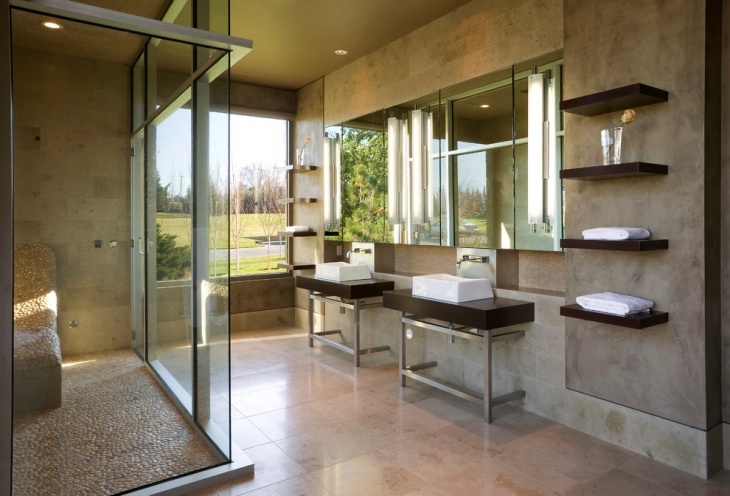 The long glass shower enclosure, the vanity mirror and the pendant lights are responsible for the contemporary look. 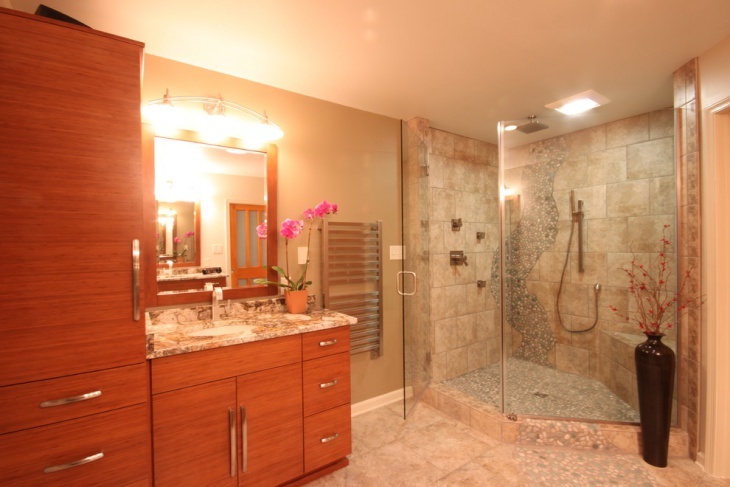 Basically, this bathroom idea is a unique incorporation of different styles. 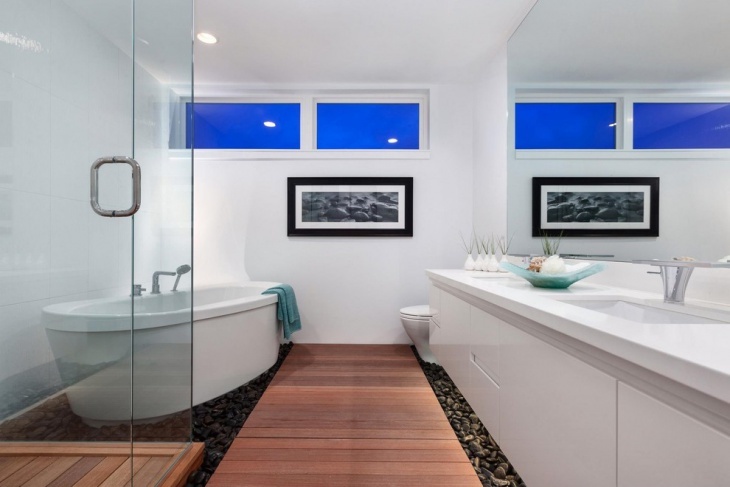 The polished river rock tiles in mixed colors that are used in this bathroom (on the floor, walls and shower installation area) provide a hint of color to the otherwise all-white design of the room. The vanity mirror and sconces combination look perfect above the sink. 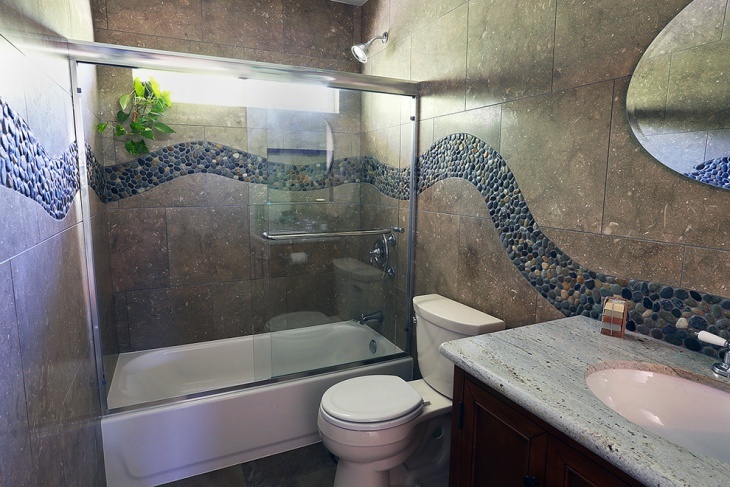 This master bath has a tub set on a second level, with the lower level surrounded by river rock tiles. The Oriental look is completed with the use of the colorful wall art decor. Of course, the indoor bamboo tree also provides the Asian appeal. 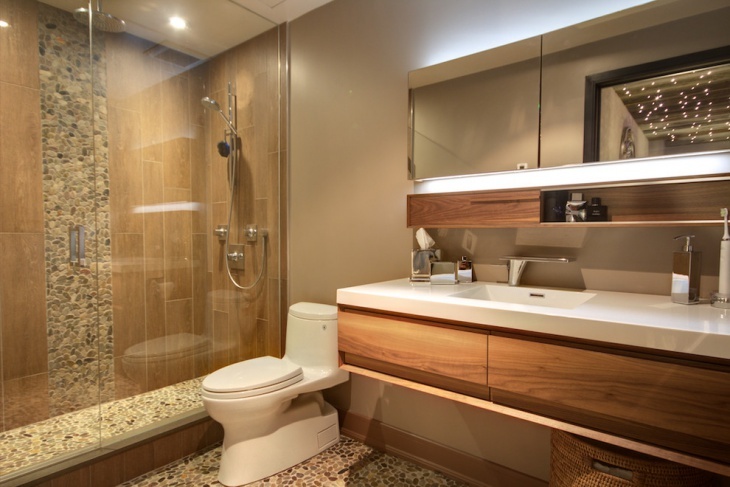 Brown wood cases are used for this bathroom design to create a look that is unique and relaxing. 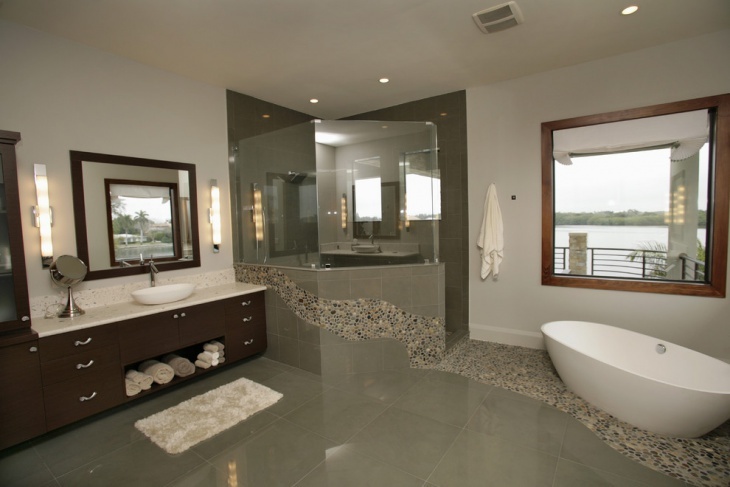 The design is beautiful with the river rock tile used to provide accent to the entire room. The whole set up is complemented with the effective combination of the rest of the features – white freestanding tub, wide wooden framed window, double framed vanity mirror, and the half glass enclosed shower area.